Evan Williams Receives StudioDaily 50 Award at NAB 2017 | Riverview Systems Group, Inc.
LAS VEGAS, NV – April 25, 2017 — At an awards presentation held at the 2017 NAB Show, Evan Williams, CEO/Co-Founder of Riverview Systems Group, Inc., Milpitas, Calif., was named a StudioDaily 50 award honoree. The award sponsored by StudioDaily – the leading news site for independent filmmakers, directors, producers, cinematographers, editors, visual effects and motion graphics artists and a wide array of technologists working in production and post – honors a cross section of influential creative professionals whose leadership exemplifies innovative thinking. Riverview Systems Group is the award-winning full-service provider of engaging and innovative live events that specializes in the rental, sale, design, installation and implementation of lighting, sound and video systems for corporate, retail, museum and educational markets. “The StudioDaily 50 pays tribute to creatives, technologists, executives and others who exemplify the boundary-pushing spirit of innovation that drives our industry forward in their day-to-day work. In that spirit, we’re delighted to honor Evan’s contributions by including him in this year’s StudioDaily 50 list,” Frazer said. With 30 years and counting under its belt, Riverview Systems Group is known for its creative and technical service support of corporate events, trade and award shows in the video, audio, and lighting disciplines, and has been the recipient of numerous industry awards including an Infocomm/L&SA Magazine Staged Event Award in both 2010 and 2011. Evan holds a Bachelors degree in Accounting and Finance, as well as Theatre Technology, and a Master’s degree in Lighting Design and Theatre Technology. 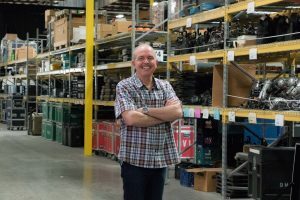 In addition, he is a member of IATSE and an adjunct member of Infocomm’s Rental and Staging Council, and has been the Production Director on the PLASA Board of Directors since 2009; and held faculty and staff positions at Indiana University, as well as San Jose State University, continuing the growth and evolution of the entertainment industry through education. Additionally, Evan has designed over 600 Theatrical and Industrial productions since 1982, and has been the Production Stage Manager for events such as the DGA Honors, the Gotham Awards for Bravo Television and the Opening ceremonies for the premiere of the Tribeca Film Festival in 2002. A profile of Williams and the other StudioDaily 50 list of award winners is now available here.